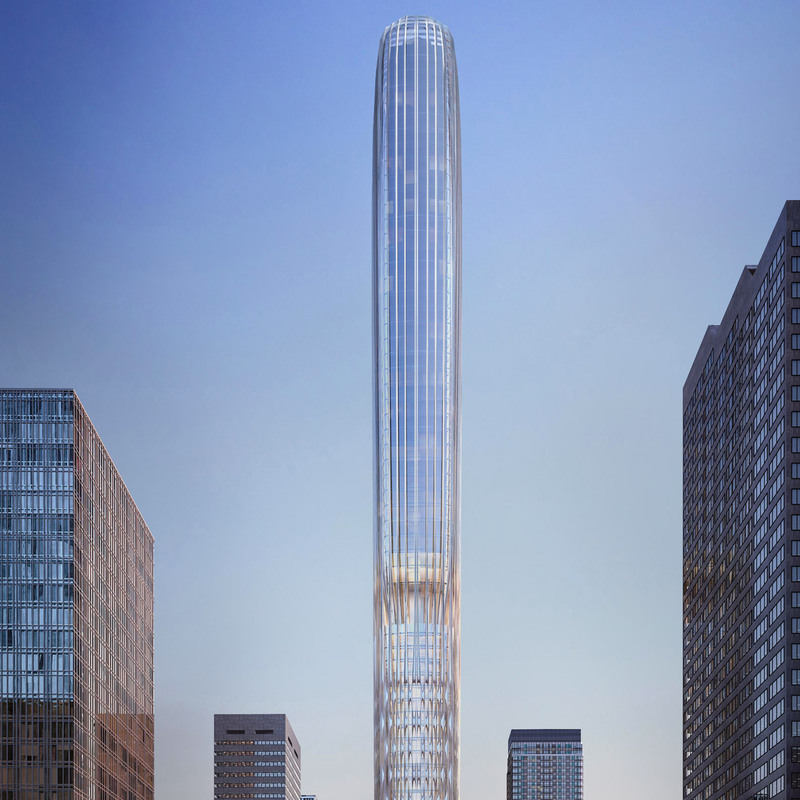 Moscow-based studio Meganom has been tapped to design its first US project – a slender, 305-metre residential skyscraper planned for Midtown Manhattan. The supertall tower, called 262 Fifth Avenue, is slated to rise in the Nomad district near Madison Square Park. The skyscraper will ascend to 1,001 feet (305 metres) and will be “unlike anything else built in New York”, according to the team. “A progressive example of forward-thinking and contemporary design, it will include several ‘firsts’ in terms of its design and environmental sustainability features,” said the team. Last year New York-based Uruguayan architect Rafael Viñoly completed the supertall, 425-metre-high 432 Park Avenue in the city. 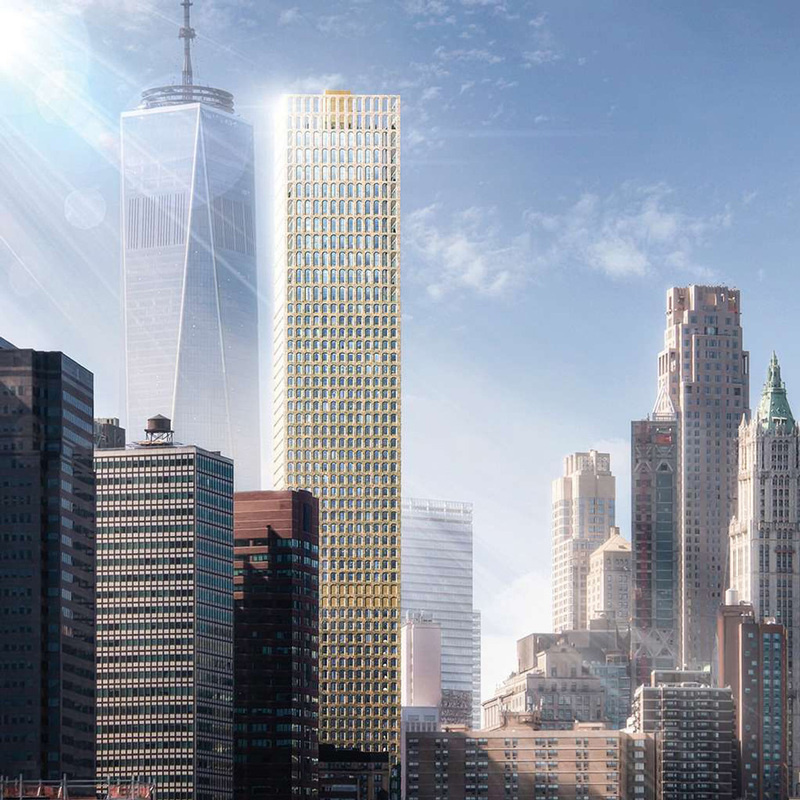 The slim skyscraper by Meganom will occupy a parcel that spans from 260 to 264 Fifth Avenue. Two vacant structures are being demolished to make way for the tower, while a historic, 12-storey limestone building will be integrated into the skyscraper’s base. The project will be Meganom’s first in America. Founded in 1998, the Moscow-based architecture and urban design firm led by Yury Grigoyan, llya Kuleshov, Elena Uglovskaya and Artem Staborovsky. The firm’s recent commissions include an extension to the Pushkin State Museum of Fine Arts, the renovation of the Kremlin Museum and the creation of a new masterplan for Gorky Park – all located in Moscow. “Meganom is virtually unknown in the West, yet have tackled some of the biggest and most complex projects in Russia,” said the team. 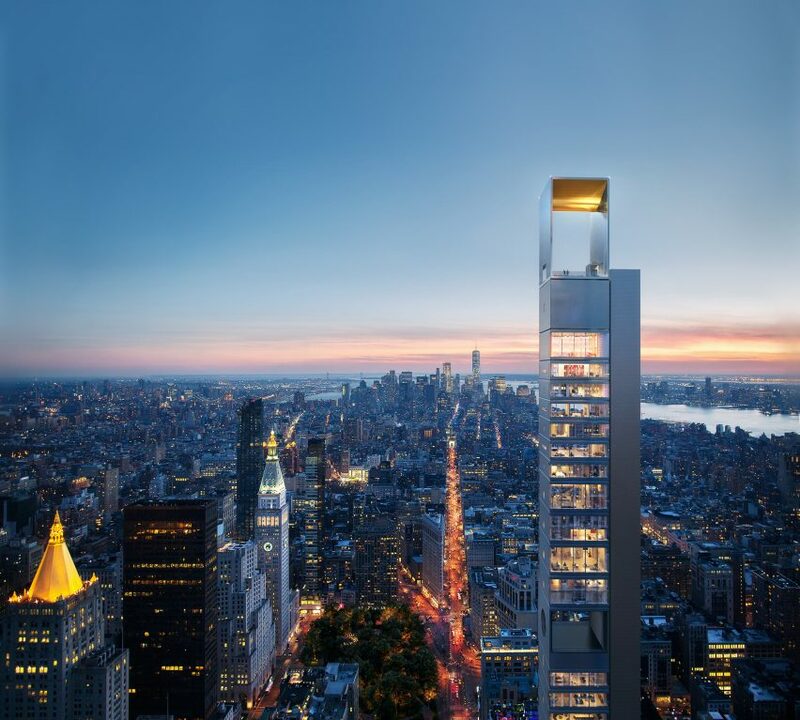 For the Manhattan project, the studio has conceived a narrow tower wrapped in aluminium and glass. The eastern facade will feature oversized and perforated porthole windows. On the north and south elevations, floor-to-ceiling windows will offer residents expansive views of the city. The tower will be topped with a rectilinear crown that will serve as a viewing area. “At its summit, a soaring metal frame will create a striking arched observation deck atop the skyscraper,” said the architects. The tower’s form is influenced by its structural system. A mechanical core will run up the west side of the tower, as opposed to the centre, which will enable column-free living spaces. “The form of the skyscraper is inspired by a unique structural system that separates the building’s functioning core from its living spaces, creating expansive, unobstructed, column-free and customisable full-floor residences – an inventive design solution unprecedented in a New York high-rise,” said the team. Demolition work recently got underway on the site. New York-based firm SLCE is serving as architect of record, and WSP is providing infrastructure and engineering services. The project is backed by Five Points Development, a new US-based venture led by Israeli developer Boris Kuzinez. The real estate company has worked with Meganom on a number of projects, including the Tsvetnoy Central Market in Moscow. Other supertall tower projects in New York include a proposed skyscraper in Midtown Manhattan designed by Zaha Hadid Architects and developed by the family of Donald Trump’s son-in-law.